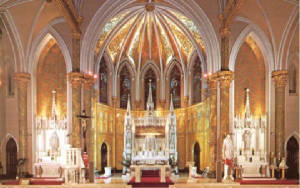 St. Peter's Roman Catholic Church is part of a cluster of parishes in Troy, New York that includes St. Paul the Apostle, St. Patrick's, St. Augustine's, Christ Son of Justice Newman Chapel at RPI and Our Lady of Victory. Marian devotions after Sat 8:30 am Mass. Reconciliation Sat 3:45 to 4:15 or by appointment. Masses: M-Fri 12:00 pm (except for First Friday 8 AM-Low Latin Mass) Sun 10:30 am; 1st Sunday High Latin Mass 12:30, else Sunday Low Latin Mass at noon; Holy Days Usually at 6:30 PM; confessions: Before Mass. Any time upon request.